Originally published under the title "Fighting the BDS Movement." Is it possible for the Boycott, Divestment and Sanctions (BDS) movement to be anything other than anti-Semitic? On January 7, 140 people in Rochester, New York attended a lecture on the topic by Miriam F. Elman, associate professor of political science at Syracuse University's Maxwell School of Citizenship and Public Affairs. The event was organized and hosted by a local non-profit called Roc4Israel, founded in 2012 expressly to "counter the negative rhetoric towards Israel, expose the rising tide of global anti-Semitism, fight against BDS, and defend Israel's right to exist." As Elman told her audience, "in the Middle Ages Jews were hated for their religion, in the nineteenth and twentieth centuries they were hated for their race, and today they are hated for their nation-state." Excepting some fringe student groups enthusiastic about boycotting Israel, the BDS movement is mostly absent from the academic scene in Rochester. The president of the University of Rochester, Joel Seligman, is a vocal critic of the movement. And while there are academics in town who sympathize with the movement enough to sign statements, at the moment BDS has no visible academic advocates in Rochester. Syracuse, NY, located little more than an hour's drive away, is a different story. Its academic scene has a far more active BDS movement. A group calling itself the Syracuse Peace Council is an active BDS agitator. In May 2015, Cazenovia College hosted BDS factotum Alison Weir (purveyor of the website "If Americans Knew"). Syracuse University itself has some very visible BDS advocates such as Vivian May, Zachary Braiterman, and others. However, the topic was well-known enough to draw a crowd, on a cold winter's evening, to an academic lecture. Nearly filling a spacious, tiered-seating auditorium, the audience was far larger than most political science or Middle East studies colloquia would attract at any of the area colleges. Elman is no firebrand rhetorician, but rather a level-headed, meticulous scholar. She focused on the differences between legitimate criticism of Israeli policies and anti-Semitism, which "is not in the eye of the beholder." Anti-Semitism "crosses the line" surpassing the merely uncivil to constitute an assault on Jewish identity. We see it when historical and cultural links between Jews and Israel are refuted and when Israel is singled out for scrutiny like no other nation on earth. Most of all, we see it when three age-old stereotypes of Jews are projected onto the entire nation of Israel: the lust for power and control, the lust for blood, and the portrayal of Jews as animals, inferior to non-Jews. This rhetoric is the lifeblood of the BDS movement. Holocaust inversion is ubiquitous in the BDS movement. 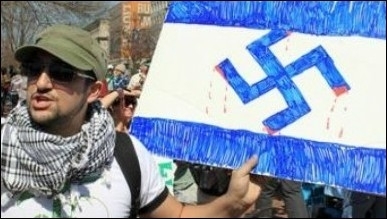 Elman noted the correlation between anti-Semitic activity on college campuses and campuses with active BDS movements. She shocked her audience with examples of high-profile academics like Judith Butler, Steven Salaita and others who "couch their assaults on Israel in the language of human rights" and use their skills to construct a narrative portraying Israel as the ideological successor to Nazi Germany. Scholars refer to this ugly slur as "Holocaust Inversion" – which, in the words of Manfred Gerstenfeld, is "the portrayal of Israelis and Jews as modern-day Nazis." Elman explained the role "progressive" Christian churches play in BDS, personalizing her presentation by highlighting the Third Presbyterian Church, located four miles from the site of the lecture, and a group called Witness Palestine Rochester. 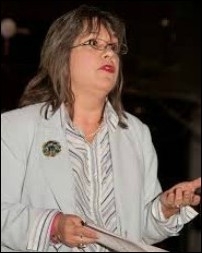 She warned ominously that the most prominent BDS organizer of all has a local chapter: "You have SABEEL here, in Rochester, operating under the moniker -- Christians Witnessing for Palestine." Perhaps most unexpected was Elman's critique of Jewish groups involved in the BDS movement. Most people are familiar with the 2,000 year history of Christian anti-Semitism and the 1,400 year history of Islamic anti-Semitism, but it seems counterintuitive that Jews could oppose the existence of Israel. Nevertheless, this is indeed the case. Clemens Heni calls it "cosmopolitan anti-Zionism." He argues that "Jewish anti-Zionists give hatred of Israel a kind of kosher stamp." They also give non-Jewish anti-Semites an apparent Jewish ally in their bigotry. The most prominent of these groups is the Jewish Voice for Peace (JVP), which Elman calls "a shield for Israel bashing." The JVP is a new presence in town, and according to its Facebook page, was cofounded by a professor at the University of Rochester. The timing of Elman's talk was fortuitous, coming just two days after the American Historical Association voted 144 to 55 against joining ranks with the BDS movement. The AHA's decision is praiseworthy, but it runs counter to the current tide. The BDS movement is growing, and it has been endorsed by the world's most famous academic, Steven Hawking. And even though BDS votes may actually be illegal, and the American Association of University Professors (AAUP) opposes academic boycotts, many academic associations are moving ahead with efforts to impose full economic and academic boycotts of Israel, including barring their colleagues (who may not share their alacrity for anti-Zionism) from collaborating with Israeli scholars. Daniel Pipes has written that when it comes to support for Israel, "Political views matter more than religiosity." He cites Frank Newport's analysis of Gallup polls from 2001 to 2014 indicating that "nonreligious Republicans are more likely to sympathize with Israelis than highly religious Democrats." There are no conservatives in BDS ranks. The BDS movement is an outcome of the New Left's dominance in American academia, especially Middle East studies. Naturally, BDS gained momentum as its proponents gained rank within their respective institutions. David C. Rapoport has observed that, "When the Vietnam War ended in 1975, the PLO replaced the Viet Cong as the heroic model" for New Left thinkers. As the Palestinians became the Left's new underdog, Israel became its new villain. It is no coincidence that 1975 was also the year that the UN passed the infamous Resolution 3379 equating Zionism with Racism. After they colonized the academic world, many of these anti-colonialists, post-colonialists, and credentialed social justice warriors applied their learning and their paradigms to writing the narrative that Jews have no history in Israel (which they call "Palestine"), that Israel is an Apartheid state, that democracy is only for Jewish Israelis, and other easily-disproved falsehoods. At a time when much of academe is jumping on the BDS bandwagon, there is little risk to academics who join the movement, whereas opposition to majority leftist positions often leads to a perilous path. Elman's expose of the anti-Semitism inherent to the BDS movement is especially impressive at a time when most conservative academics keep their opinions to themselves. But Elman is hardly a "conservative." She identifies herself as a "lapsed liberal [who sides] with progressives on many social issues and with conservatives on most foreign policy issues." Teaching at a school where dissenters are treated respectfully and diversity of perspective is valued, this writer can only wonder what life is like for Miriam Elman at the Maxwell School (what SU grad has never heard it called the Marxwell School? ), which boasts as an alumnus the most influential leader of the Wahabbi Lobby, Saudi Prince Alwaleed bin Talal, who is also a member of its advisory board. The fact that she is a former member of the IDF and Jewish leaves her open to the "divided loyalties" smear, which has reappeared of late. Elman confirmed one's suspicion that her critics call her a "Neo-Con." Philip Carl Salzman may be right that "the dirtiest word in the Marxist vocabulary is "neoliberal," but when the person being smeared is Jewish, "Neo-con" still reigns supreme. Fortunately, for her students at Syracuse and for all of academia, it will take more than smears to deter Miriam Elman. A.J. Caschetta is a senior lecturer at the Rochester Institute of Technology and a Shillman-Ginsburg fellow at the Middle East Forum. This essay was sponsored by Campus Watch, a project of the Middle East Forum.